How do I install an add-on to my D-Link DNS-321/323/343 Storage Device? Step 1: Go to http://dlink.com and go to the support website for your DNS Storage Device. Download the add-on you wish to install. 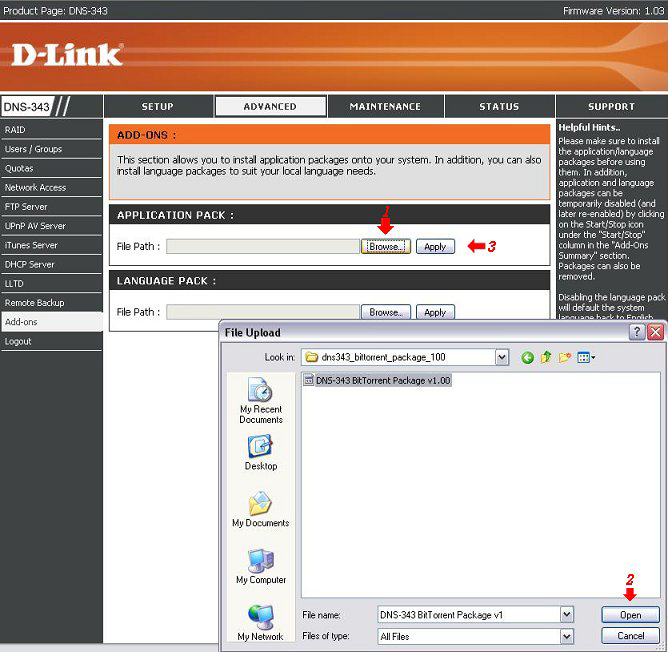 Step 2: Log into D-Link DNS-321/343 web based configuration and click the Advanced tab then click Add-ons on the left. Click Browse under Application Pack and browse for the location of the Package file and click OK. Next click Apply to load the application to the unit. Step 3: Start the application by clicking on the Start icon as shown below. You can stop the application in the same manner by clicking the Stop icon.